What is the first thing that comes to your mind when you hear the word “Jawaani” ? Youth is the most adorable phase of anyone’s life which in turn changes to a great teacher. Do not even go on my words, ask Shakespeare. In his epic poem “Seven Ages of Man” he describes Youth as a storage of raw passion, zeal and boundless energy to do anything that comes his way. Can you recall an enthusiastic Bollywood character from Shakespeare’s words – yes,it is “Kabir” from ‘ ye Jawaani hai Deewani“. 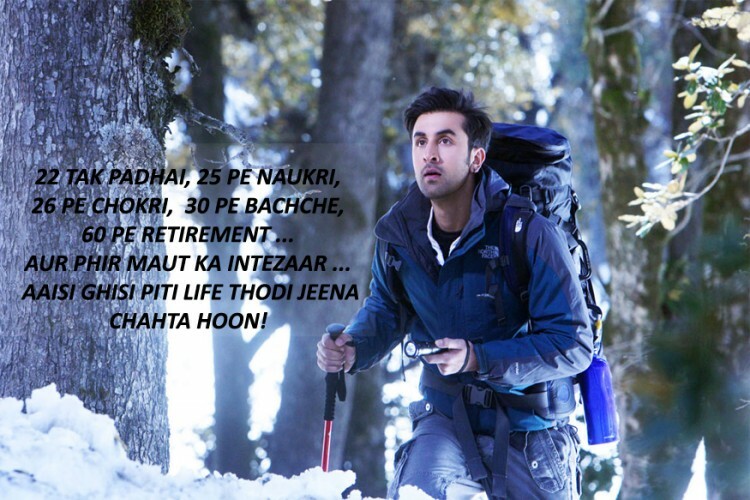 His character touched everyone’s heart with the Epic Dialogues from Yeh Jawaani Hai Deewani. After the revolutionizing success of ‘Jab We Met’ in 2007, an era of Rom-Coms had begun. People were falling in love with the concept of Rom-Coms because it attracted a huge number of audience from all walks of life, be it children to teenagers to young and the elderly, everyone liked the concept since such movies were family movies. With so many such movies in line came an extremely beautiful creation by Ayan Mukerji – “ye Jawaani hai Deewani” . An entirely different story with a perfect screenplay, exotic locations depicting the ravishing traditions of a ” Big Fat Indian Wedding ” won over the hearts of people but the main role played was by the dialogues. Go on and find out yourself from a few of the Epic Dialogues from Yeh Jawaani Hai Deewani which prove that the film is a HIT! After listening to what Naina says, I am sure that all the doctors must have got so emotional that yes, there are people who understand the sacrifices that they have to make to finally graduate. Well, its always good to take a break for ourselves and get back with a bang. This is all what we feel about our friend group even if it is full of cowards. But for us, our freinds are the best. This scene was a hilarious one with all those locals running after the four and how they tricked themselves out of this confusing situation. This was a great example of the few times when we make a fake promise just for fun in the name of our friends. You got be cautious about it ! Great words actually. It is very important to move over in life from all the pains and sorrows, all the gloomy times in order to reach to another destination which might be really beautiful. Until and unless we do not leave our past, we still remain stuck in the destructive aura that only keeps us pulling back and does not let us proceed in life. Now that’s the spirit to succeed in life. The desire of flying high, running as fast as we can, falling and rising again, even from the scratch may be and the deep hope of never stopping and moving on is the real incredible spirit that Kabir taught us all proving to be yet another one of the Epic Dialogues from Yeh Jawaani Hai Deewani . So true. This is the bitter truth of our monotonous lives. We have just forgotton the right and lively way to live. All work and no play makes Jack a dull boy. So its is very important to enjoy your life while concentrating on your work. We have got only one life, this is all with what we landed on Earth, one life, so live it to the fullest. Try to fulfill all your desires. Yes, there are innocent girls which are so good to be more good. Confused? In today’s world, full of weird relationships, you might be the lucky one to find such a girl and if you do, just do not let her go. Such girls are once in a lifetime girls. Ranbir Kapoor might tell us better though. It happens sometimes. There are some things that we can’t even tell the one we love the most for their betterment though it is a big sacrifice on our part. We might go sulking about not telling them, for not even dropping any idea for them but then, love is love. True loves make you selflessly caring for your lover. This was actually a moving scene in the film. Sometimes we spend all our precious time looking for the real happiness but fail to find it in materialisitic things. Our search ends when we finally meet the love of our life, our soulmate and realize that how beautifully has life changed for us after their addition. We come to know about the true meaning of being happy, of not just living because we have to but to enjoy every second of our life and understanding the meaning of being alive. There is a Kabir in all of us who just doesn’t want to wait to take things their own course of time to get ok. This is not done. Every thing happens at the right time only even if you keep on trying for it badly. So stay calm, work for your desire and just wait. When the right time comes, things will get fine. Ups and downs are very important part of our life. They teach us the true value of happiness. This surely must be the favorite dialogue of many. The feeling of separation and once again when life brings you at the same spot, its a big big deal to handle it then. Firstly, it is so difficult to come out of the pain of not getting the one you love and if again you land in the same situation and once again if the answer is no, trust me, it pains like a boulder that hit your foot last night on the dark road. Infact it is not going to get ok soon. Beware of the heartbreakers ! These Epic dialogues from Yeh Jawaani Hai Deewani will be remembered forever and it is truly a movie worth watch, if not yet seen, go, download it today and do enjoy it on your weekend with your friends to make it a memorable time. I am a fun and nature loving traveler who likes to read the psychology of different minds to understand the working of this world.I am a software engineer but in my free time I love to write and manage events.